Citation: Teichert M, Lehmann K, Bolz J. Visual performance in mice: physiology meets behaviour. J Behav Neurosci 2018;1: 5-10. Visual performance of animals is usually characterized by the thresholds for visual acuity and contrast sensitivity. However, established behavioral and electrophysiological methods are often time consuming or require invasive surgeries. Here we describe a novel procedure to determine visual abilities in mice, using periodic optical imaging of intrinsic signals. This is a relatively fast and non-invasive procedure to obtain reliable topographic maps in sensory cortices. First, we determined the best anesthetic conditions to obtain primary visual cortex [V1] maps with high amplitudes and good quality. After this, we demonstrate that measuring V1 activity evoked by visual stimulation with sine wave gratings of different contrasts and spatial frequencies provides reliable data of V1 contrast and spatial frequency tuning. 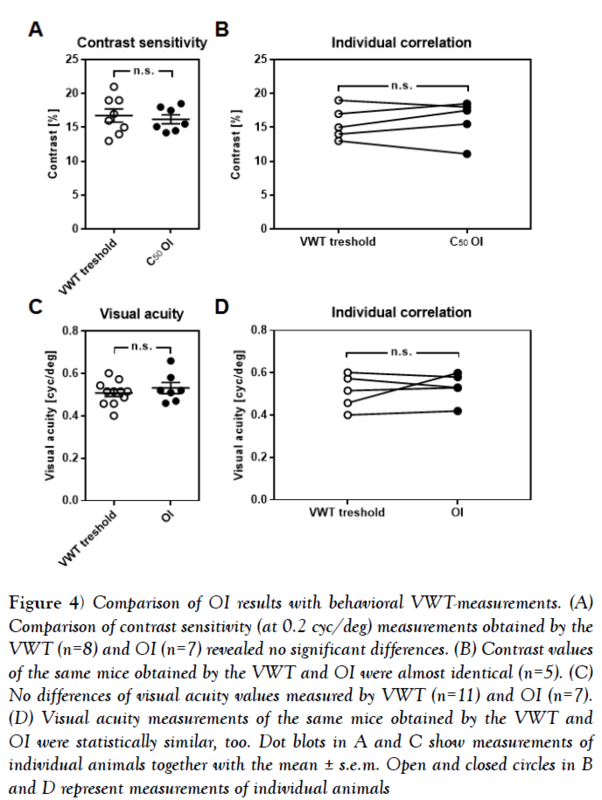 We then compared the optical imaging data with values of contrast sensitivity and visual acuity obtained using a well-established behavioral test, the visual water task [VWT]. We found a close correspondence between these different approaches. Finally, we first trained a group of mice in the VWT and subsequently used the same animals in optical imaging experiments. Strikingly, we found that our measurements of visual perception in the behavioral and physiological experiments were practically identical, also at the level of individual animals. Taken together, our results clearly demonstrate that intrinsic signal imaging enables determination of visual abilities in a fast and simple manner. Neuroscientists frequently need to characterize the sensory abilities of animals under different experimental conditions. For example, it might be of interest to determine how “good” an animal is able to see. In this case, often used benchmarks to determine visual performance are visual acuity, the ability to resolve fine details in the visual scene, and contrast sensitivity, the ability to discriminate between differences in the brightness of visual stimuli. However, behavioral or electrophysiological methods for the determination of visual performance and perception in rodents are often time consuming or require complex and invasive surgeries [1-5]. In addition, in most cases it remains elusive whether values of visual acuity and contrast sensitivity determined with behavioral tasks are comparable to measurements obtained with physiological techniques at the level of individual animals. A well-established physiological technique to examine responses of sensory cortices to external stimuli is optical imaging based on intrinsic signals. It enables non-invasive measurements of cortical activity over large brain areas with a high spatial resolution . In the primary visual cortex [V1], for example, optical imaging can be performed either episodically [7,8] or with periodically presented stimuli [9-12]. Periodic imaging combines continuous-periodic stimulation with continuous data acquisition [9,13]. In this way, intrinsic noise can be effectively separated from the stimulus evoked cortical responses using Fourier analysis, drastically speeding up the imaging procedure [6,9]. Episodic imaging has also been shown to be suitable for determining visual acuity and contrast tuning at the level of V1 [14,15]. Although less time consuming, periodic imaging has not yet be adapted to these purposes. In addition, it is unclear whether acuity and contrast sensitivity values obtained by measuring visually driven V1 activation reflect the behaviorally determined thresholds for these visual abilities. In order to address this concern we developed a novel approach to determine these parameters of vision in mice using periodic intrinsic signal imaging. Since periodic imaging is typically performed in anesthetized animals [9,13,16,17], we first determined the appropriate level of anesthesia that allows to obtain reproducible visuotopic maps of high quality in V1 of mice. We then compared visual acuity and contrast sensitivity thresholds obtained by optical imaging in a group of mice with values from another group of mice where these data were obtained in a behavioral test. For the behavioral experiments we used the visual water task [VWT] which is often used for assessing mouse visual perception [4,11,18,19]. Finally, in a last set of experiments, we first trained another group of mice in the VWT and then used the same animals to determine spatial resolution and contrast sensitivity with optical imaging. Remarkably, we could show that our measurements of visual perception obtained with intrinsic imaging were almost identical to measurements determined using the behavioral VWT, even at the level of individual animals. Thus our novel imaging approach provides reliable data of mouse visual perception which can be obtained in a rapid and relatively non-invasive manner. For the present study we used adult male mice C57BL/6J [<P120, Jackson labs] mice were raised in a group of 2-3 in transparent standard cages [16.5 × 22.5 cm] on a 12 h light/dark cycle, with food and water available ad libitum. Generally, the environment in the cage was minimally enriched with cotton rolls and nest material. In our mouse facility the light intensity was about 150-170 lux. Animal housing in our institution is regularly supervised by veterinaries from the state of Thuringia, Germany. All experimental procedures have been performed according to the German Law on the Protection of Animals and the corresponding European Communities Council Directive 2010 [2010/63/EU], and were approved by the Thuringer Landesamt fur Lebensmittelsicherheit und Verbraucherschutz [Thuringia State Office for Food Safety and Consumer Protection] under the registration number 02-050/14 and 02-032/16. As described previously [10-12,20], animals were initially anesthetized with 4% isoflurane in a mixture of 1:1 O2/N2O and placed on a heating blanket [37.5°C] for maintaining body temperature. Subsequently, mice received injections of chlorprothixene [40 μg/mouse i.m.] and carprofen [4 mg/ kg, s.c.]. The inhalation anesthesia was applied through a plastic mask and maintained at 0.5% in control mice during the experiment. The animal was fixed in a stereotaxic frame and we removed the skin of the left hemisphere to expose the visual cortex. The exposed area was covered with 2.5% agarose in saline and sealed with a glass coverslip. Cortical responses were always recorded through the intact skull. To investigate the influence of anesthesia on optical imaging results, we increased the isoflurane concentration in a stepwise manner to 0.75%, 1% and 1.25%. At each concentration, the animal was allowed to reach a stable state for 10-20 min, before a pair of maps was acquired for 10 min in total using intrinsic signal imaging . V1 maps in control mice were recorded in the same temporal rhythm, but with stable anesthesia at 0.5% isoflurane. Responses of the mouse visual cortex were recorded as originally described by Kalatsky and Stryker . Briefly, the method uses a periodic stimulus that is presented to the animal for some time and cortical responses are extracted by Fourier analysis. We used different periodic stimuli in our experiments. For the assessment of map amplitude and map quality in relation to anesthesia, the eyes were stimulated with a vertically drifting horizontal bar of 2º width, moving at a temporal frequency of 0.125 Hz, with 80º distance between bars. The stimulus was created by custom software [Kalatsky & Stryker ]. Both maps for upward and downward drifting bars were acquired and averaged for the removal of the hemodynamic delay. For the measurement of visual acuity and contrast tuning, we created horizontal sine-wave patterns which reversed every eight seconds, using the program Psychopy [11,12]. All stimuli were presented on a high refresh rate monitor [Hitachi Accuvue HM 4921-D] placed 25 cm in front of the animal. Visual stimulation was adjusted such that it only appeared in the binocular visual field of the recorded hemisphere [-5° to +15° azimuth, -17° to +60° elevation]. The stimulus was presented alternately to each eye for 5 min [for the moving bar stimulus]. All images were all acquired directly through the skull. A Dalsa 1M 30 CCD camera [Dalsa, Waterloo, Canada] with a 135 mm × 50 mm tandem lens [Nikon, Inc., Melville, NY] first recorded images of the surface vascular pattern via illumination with green light [550 nm] and, after focusing 600 μm below the cortical surface, the intrinsic signals were obtained via illumination with red [610 nm] light. Frames were acquired at a rate of 30 Hz and temporally averaged to 7.5 Hz. The 1024 × 1024 pixel images were spatially binned to a 512 × 512 resolution. From the recorded frames the signal was extracted by Fourier analysis at the stimulation frequency and converted into amplitude and phase maps using custom software . In detail, from a pair of the upward and downward maps, a map with absolute retinotopy and an average amplitude map were computed. For data analysis we used the MATLAB standard as described previously . The amplitude component represents the activation intensity of the visual cortex. Since high levels of neuronal activity decrease oxygen levels supplied by hemoglobin and since deoxyhemoglobin absorbs more red light [610 ± 2 nm], the reflected light intensity decreases in active cortical regions. Because the reflectance changes are very small [less than 0.1%] all amplitudes are multiplied with 104 so that they can be presented as small positive numbers. Thus, the obtained values are dimensionless. Amplitude maps were obtained by averaging the response amplitudes of individual pixels from maps to upward and downward moving bars. As a measure of the quality of retinotopic maps, we calculated the scatter of maps obtained by stimulation of the contralateral and ipsilateral eyes, as described elsewhere . We selected all the pixels with amplitude of at least 30% of the greatest response magnitude. The phase value of each pixel was compared to the mean phase value of its 24 surrounding pixels, and the standard deviation of these differences was taken as the map scatter. It is small in maps with a high quality. Visual acuity and contrast sensitivity were determined using optical imaging of intrinsic signals [9,14,15] as described above. Visual stimuli were fixed sine wave gratings of various spatial frequencies [0.1, 0.2, 0.3, 0.4 and 0.5 cyc/ deg [cycles per degree] at 90% contrast] and contrasts [90, 50, 20, 10 and 5% at 0.2 cyc/deg] reversing after 8s [temporal frequency: 0.125 Hz] [11,12]. In order to obtain one amplitude map to one spatial frequency or one contrast we stimulated both eyes for 2.5 min. For each condition we averaged at least two amplitude maps. For determining the visual acuity, we used the strongest amplitude map [usually obtained with the lowest spatial frequency] to set the region of interest as the area including all pixels with at least 30% of the maximum response pixel. As the final response we took the mean amplitude within this area for all obtained maps. Additionally, we subtracted the background activity of V1 within this area evoked by stimulation with a grey blank with the same luminance as the sine wave gratings from all obtained responses to set the background to zero. Background level was measured in the region of V1 after stimulation with a grey blank. Visual acuity was then defined as the intersection of a linear regression, fitted to the data points, with the x-axis. For determination of contrast sensitivity we used maximum responses of the amplitude maps to each contrast. Data points were fitted using a Naka-Ruston equation [15,22,23] to obtain the contrast-tuning-curves. For each animal we determined the C50 as the contrast at the half maximum response. This value was defined as cortical contrast sensitivity . All data were analyzed using MATLAB. To assess behavioral contrast sensitivity and visual acuity, we used the VWT, a visual cortex dependent visual discrimination task based on reinforcement learning [1,4,24,25]. Initially, animals were trained to distinguish vertical sine wave grating with a low spatial frequency [0.1 cyc/deg] and 100% contrast from a grey with the same luminance. Subsequently, their ability to perceive varying contrasts at a spatial frequency of 0.2 cpd was tested. In another group of mice we determined visual acuity at 90% contrast. The apparatus is a water filled trapezoidal-shaped pool, with two monitors placed side by side on the wider end. A midline divider between the two monitors sets the choice point between both visual stimuli. Below the monitor showing the sine wave grating a submerged platform is placed invisible to the animals. The position of the grating and the platform was changed in a pseudorandom manner during training and testing. Animals were trained and tested 10 times in one session, and two sessions separated by 3 h were run in a single day. The task was performed with off-switched room lights. After achieving 90% accuracy, we determined the contrast or spatial frequency thresholds by reducing the contrast or spatial frequency of the sine wave gratings until the level of correct attempts dropped below 70%. After achieving a stable level of visible contrasts or spatial frequencies for 10 days, all runs within this time were used to calculate frequency-of-seeing curves for each animal. i.e., percentage of correct responses was plotted against contrast or spatial frequency, respectively. The values at which the curve dropped below 70% were calculated by interpolation. Visual cortex response amplitudes and the scatter of the obtained maps under constant and varying isoflurane concentrations were compared by a paired of unpaired t-test. Optical imaging and VWT data of individual animals were compared by a Wilkoxon signed-rank test. The level of significance was set as *:p<0.05; **:p<0.01; ***p<0.001. Data are presented with mean and standard error of the mean [s.e.m]. As a first step, we investigated whether alterations in the anesthetic level affect cortical maps of the primary visual cortex [V1] obtained by Fourier based periodic imaging. For this, we gradually increased the concentration of isoflurane from 0.5% to 1.25% isoflurane during one optical imaging session. At each step animals were stimulated visually with a moving light bar presented on a black monitor screen and we recorded the responsiveness of V1 of the left hemisphere. 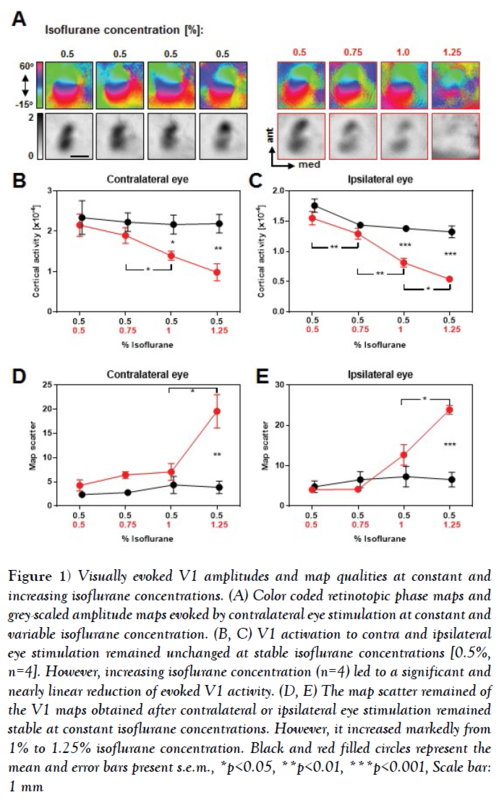 Figure 1A depicts representative color coded phase and grey-scaled magnitude V1 maps evoked by visual stimulation of the contralateral eye at constant [left] and increasing [right] isoflurane concentrations. It is clearly visible that at constant isoflurane concentrations the phase maps remained smoothly retinotopically organized and the activity patches of the amplitude maps were equally strong during the time tested [4-5 h]. However, increasing the isoflurane concentration led to an impairment of the phase map quality, predominantly at 1.25% isoflurane, and the activity spots of the amplitude maps got gradually weaker. Our quantification revealed that in control animals [with constant 0.5% isoflurane anesthesia], V1 responsiveness to both contralateral and ipsilateral eye stimulation remained stable during the imaging session (Figures 1B and 1C) (Table 1), n=4, V1 activation elicited by contralateral eye input: all p-values >0.05, paired t-test; V1 activation elicited by ipsilateral eye input: all p-values >0.05, paired t-test). In contrast, V1 activity evoked by visual stimulation of the contralateral or ipsilateral eye stimulation gradually decreased with increasing isoflurane concentrations (Figures 1B and 1C) (Table 1), n=4, V1 activation elicited by contralateral eye input, 0.5% vs. 0.75% [isoflurane]: p=0.35; 0.5% vs. 1%: p=0.03; 0.5% vs. 1.25%: p=0.02; 0.75% vs. 1%, p=0.02; 0.75% vs. 1.25%, p=0.02, paired t-tests; V1 activation elicited by ipsilateral eye input, 0.5% vs. 0.75%: p=0.009; 0.5% vs. 1%: p=0.003; 0.5% vs. 1.25%: p=0.003; 0.75% vs. 1%: p=0.003; 1% vs. 1.25%: p=0.04, paired t-tests]. These changes of V1 responsiveness were significantly different from control values at 1% and 1.25% isoflurane concentration for both, V1 contralateral and ipsilateral eye input (Figures 1B and 1C) (Table 1). Contralateral eye input, 0.5% vs. 1%: p=0.03; 0.5% vs. 1.25%: p=0.009, unpaired t-tests; ipsilateral eye input, 0.5% vs. 1%: p=0.0005; 0.5% vs. 1.25%: p=0.0002, unpaired t-tests]. In summary, our data indicate that the concentration of isoflurane and thus, the depth of anesthesia markedly affect the strength of V1 responses evoked by visual stimuli. Often, there is a positive correlation between the strength of the intrinsic signals and the quality of the map which can be quantified by the so called map scatter . However, in some cases stronger responses can also weaken the quality of the corresponding maps . In order to examine the effects of the anesthesia level on the quality of the retinotopic polar maps, we calculated the map scatter in each recording session. Our quantification revealed that the scatter of the V1 maps evoked by visual stimulation of the contra and ipsilateral eye remained constant within 4-5 h under stable isoflurane concentration of 0.5% (Figures 1D and 1E) (Table 2) n=4, Scatter of the V1 maps evoked by contralateral eye input: all p-values > 0.05, paired t-tests; Scatter of V1 maps evoked by ipsilateral eye input: all p-values >0.05, paired t-tests]. However, increasing the isoflurane concentration led to a slightly increased scatter of the evoked V1 maps, which then markedly increased at the highest isoflurane concentration [1.25%] (Figures 1D and 1E) (Table 2) n=4, Scatter of the V1 maps evoked by contralateral eye input, 0.5% vs. 0.75% vs. 1%: all p-values >0.05; 0.5% vs. 1.25%: p=0.03; 1% vs. 1.25%: p=0.04, paired t-tests; Scatter of the V1 maps evoked by ipsilateral eye input, 0.5% vs. 0.75% vs. 1%: all p-values >0.05; 0.5% vs. 1.25%: p=0.0002; 1% vs. 1.25%: p=0.02]. Taken together, our data suggest that increasing the isoflurane concentration and thus altering the anesthetic state of the animal dramatically affects the strength and quality of visually evoked V1 maps. Particularly, V1 maps with the strongest amplitudes and the best quality were always obtained at the lowest concentration of isoflurane [0.5%]. Knowing the anesthetic conditions to obtain high quality visually evoked V1 maps [0.5% isoflurane], we further asked whether periodic optical imaging [OI] under these conditions is also appropriate for assessing the visual perception of mice. To determine contrast sensitivity and visual acuity, we adapted the periodic OI method originally developed by Kalatsky and Stryker . Here, the account of our initial failures is interesting and instructive in its own right. Our first approach was to measure V1 responses after binocular stimulation with the standard drifting white-on-black square bar. Surprisingly, visual cortical retinotopic maps did not deteriorate with decreasing bar width, but remained strong and well organized even when the resolution limits of the screen were reached [data not shown]. We therefore next tried a drifting horizontal sine wave [consisting of one black and one white bar on grey background] of different spatial frequencies at a temporal frequency of 0.125 Hz. This, too, failed to provide reliable values of visual acuity. Although there was a clear negative correlation between map amplitude and spatial frequency, the resulting visual acuity values were widely scattered and always far beyond the behaviorally confirmed visual capabilities [data not shown]. Therefore, instead of a drifting visual stimulus, we next presented a stable horizontal sine wave grating of varying contrasts or spatial frequencies in the binocular visual field for 2.5 min, reversing after different time periods [2s, 4s, 8s, 12s and 16s]. Pattern reversal after 2s and 4s provided only weak maps with poor quality. Using pattern reversal after 12s and 16s evoked strong maps, which were, however, of low quality [data not shown]. However, V1 maps with both high amplitudes and high quality were always obtained by reversing the pattern after 8s (Figure 2A). Hence, we used this visual stimulus timing to determine contrast sensitivity and visual acuity. In order to quantify contrasts sensitivity, we measured the V1 response amplitudes evoked by visual stimulation with 5 different contrasts [90%, 50%, 20%, 10% and 5%] at 0.2 cyc/deg [cycles per degree], which has been described as the spatial frequency at which the behavioral contrast sensitivity of mice peaks . Data points were fitted using a Naka-Rushton equation [15,22,23] to obtain contrast-tuning-curves. For each animal we determined the C50 as the contrast at the half maximum response and defined this value as contrast sensitivity. 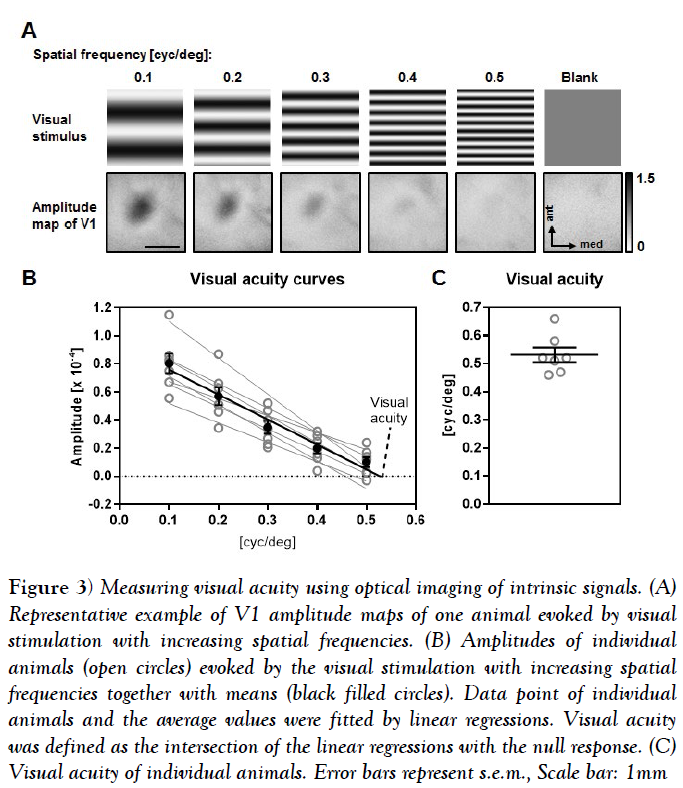 Figure 2B depicts the presented visual stimuli of different contrasts and the related magnitude maps of V1 obtained after binocular visual stimulation of one representative animal. It is clearly visible that the activity spots got weaker along with decreasing the contrast, while a grey blank stimulus did not evoke activity in V1. In Figure 2C the map amplitudes evoked by the visual stimulation with different contrast of 7 individual animals together with the mean values are illustrated. Fitting them with the sigmoidal curve provided a high coefficient of determination for each animal [n=7] mean R squared =0.9925 ± 0.0018]. Determining the C50 of all mice revealed a mean contrast sensitivity of 16.19 ± 0.67% (Figure 2C). In order to determine visual acuity, we used the same visual stimulus pattern as for contrast measurements (Figure 3A). Here, we measured the V1 response to binocular visual stimulation with reversing sine wave gratings at 5 different spatial frequencies [0.1 cpd [cycles per degree], 0.2 cpd, 0.3 cpd, 0.4 cpd, 0.5 cpd]] at 90% contrast. For determining the background signal of V1, we presented a grey blank with the same luminance as the sine gratings. The obtained amplitude values for each condition were fitted by a linear regression and the spatial frequency at the null response was used as a proxy for visual acuity. Figure 3A illustrates the visual stimuli and the related amplitude maps of V1 evoked after binocular stimulation with decreasing spatial frequencies of one individual animal. Activity spots got weaker from the lowest to the highest spatial frequency and the blank stimulus evoked no activity patch within the V1 area. Our quantification showed that in all 7 animals tested the amplitudes of the V1 response gradually decreased with increasing spatial frequencies. Fitting the amplitude values of the single animals with a linear regression revealed a high correlation with the spatial frequency [n=7, mean R square =0.9539 ± 0.017] (Figure 4B). Calculating the mean of the intersections of the linear regressions with the y axis revealed an average visual acuity of 0.53 ± 0.03 cyc/deg (Figures 4B and 4C). Taken together our results show that Fourier based periodic imaging is useful method to determine V1 contrast and spatial frequency tuning. Finally, we investigated whether the values of contrast sensitivity and visual acuity determined by periodic intrinsic imaging are comparable to measurements obtained by behavioral tests. 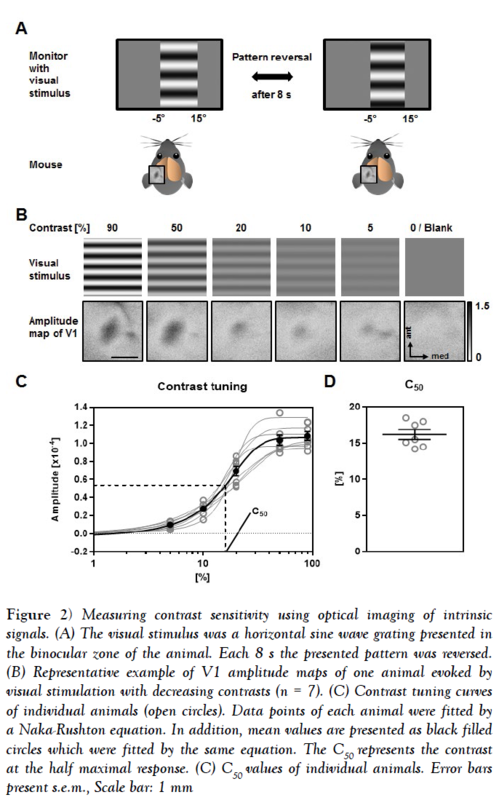 To verify the contrast values revealed by intrinsic signal imaging, we first determined the behaviorally relevant contrast sensitivity in 8 mice using the visual cortex dependent visual water task [VWT] [1,4]. Using this method, we found the contrast threshold at 0.2 cyc/deg to be at 16.75% ± 0.98% in mice [n=8]. This value is statistically indistinguishable from the C50 values obtained with intrinsic signal imaging [n=7, 16.19% ± 0.67%, p=0.65, unpaired t-test] (Figure 4A). These data were, however, obtained from two different sets of animals. In order to check for a correlation at the individual level, we next measured behavioral contrast sensitivity at 0.2 cyc/deg in a new set of mice [n=5] and subjected these same animals to optical imaging after completion of the behavioral testing. Strikingly, the contrast values obtained in the VWT and by intrinsic signal imaging were almost identical (Figure 4B) [n=5, p>0.05], Wilkoxon signed-rank test]. Notably, it took us weeks to obtain stable values of contrast sensitivity in the VWT, whereas periodic imaging was completed within about 2 h.
In the same manner, we validated the reliability of our imaging method for measuring visual acuity in mice. As quantified by the VWT, C57BL/6 mice had visual acuity of 0.51 cpd ± 0.02 cpd [n=11], which is not significantly different from the values obtained by optical imaging (Figure 4C) [n=7, 0.53 cpd ± 0.03, p=0.44, unpaired t-test]. Again, we took a subset of the animals investigated in the VWT [n=5] and measured their visual acuities by OI, arriving at almost identical values (Figure 4D) [VWT vs. OI, n=5, p>0.05, Wilkoxon signed-rank test]. In summary, these data show that determination of mouse visual perception with periodic OI provides reliable data almost identical to those obtained by conventional methods like the VWT. Strikingly, these results reveal a close match of visually evoked V1 amplitudes and V1 dependent behavior. In the present study we described a novel physiological technique which allows the determination of contrast sensitivity and visual acuity in mice in a fast and simple manner. Notably, we found a close match of visual acuity and contrast sensitivity values obtained by optical imaging and by a commonly used behavioral task [VWT], even at the level of individual animals. Hence, our novel method provides highly reliable values of mouse visual abilities. In experimental animals, visual acuity is commonly operationalized as the threshold for behavioral discrimination of sine wave gratings from equi luminescent grey [1,27]. Unlike measures depending on subcortical reflexes [e.g. the threshold for the optokinetic reflex] , discrimination tasks depend on the visual cortex. It has therefore become experimental standard to target the visual cortex directly for measuring visual acuity. Recordings of visually evoked potentials [VEP] are routinely used to this end [2,5,28] delivering visual acuity values of approximately 0.5-0.6 cpd in mice. Similar visual acuities have been measured by episodic optical imaging  and now, in the present study, by periodic optical imaging (Figure 2). The values are in the same range as those obtained by behavioral testing [1,4,25,29] and, remarkably, show a close correspondence with behaviorally obtained values in individual animals, confirming the validity of our method (Figure 4). In order to generate valid data, we had to stimulate the animals with a reversing sine-wave grating, rather than with the usual moving single bar. If a moving bar of decreasing width was used, the elicited visual cortical activities would either-for a sine bar-scatter widely around too high values, or even-for a square, white-on-black bar-remain at constant high levels all through to the limits of screen resolution. These observations illustrate the important difference between detection and discrimination: Whereas single moving visual events merely need to be detected, pattern-reversing sine wave gratings stimuli must be discriminated from uniform grey. The latter kind of stimulus is therefore used by researchers measuring visual acuity with VEPs or episodic optical imaging [2,3,5,14], and needed to be employed in order to adapt periodic imaging to this end (Figures 2A and 3A). Unlike visual acuity, contrast sensitivity has rarely been measured in mice. Using the visual water task, Prusky and colleagues  have established a contrast tuning curve for mice which peaks at 0.2 cyc/deg, where mice are able to distinguish a contrast of approximately 17%. This value is precisely confirmed by VEP recordings [2,3,5] and now by the present study by intrinsic signal imaging (Figure 3). Again, the close correlation between contrast tuning values obtained behaviorally and with optical imaging across individual animals underlines the validity of our measurements. Visual acuity and contrast tuning are highly relevant values for assessing the visual capabilities of experimental animals, e.g. in amblyopia research [18,28,30]. The optical imaging method that we have established here, allows for the extraction of these data within only a few hours. Behavioral testing, in contrast, takes weeks of daily training and testing in mice . Compared to VEP recordings, optical imaging offers the advantage of being minimally invasive, such that in combination with a cranial window, measurements can be performed repeatedly, even daily, without injuring the brain. Growing evidence suggests that i.e., attention [31,32], learning [33,34] and cross-modal interaction of primary sensory cortices [12,20,11,35] can modulate V1 activity. Hence, it will be interesting to examine whether such subtle changes can be detected with the novel imaging method described here. Notably, we could recently show that cross-modal inputs from both the auditory and somatosensory cortex can indeed modulate V1 contrast and spatial frequency tuning as measured by intrinsic signal imaging [11,12,20]. Again, there was a close correspondence between these physiological data and the data obtained by behavioral tasks. We therefore believe that the method developed here will become useful for researchers studying longitudinal changes in the visual capabilities of experimental animals. We wish to thank Steven Wenig and Christoph Setz for their help with the visual water task experiments, Elisabeth Meier for excellent technical assistance and Sandra Eisenberg for animal care. Prusky GT, West PW, Douglas RM. Behavioral assessment of visual acuity in mice and rats. Vision Research 2000;40:2201-2209. Porciatti V, Pizzorusso T, Maffei L. The visual physiology of the wild type mouse determined with pattern VEPs. Vision Research 1999;39:3071-3081. Pinto L, Drechsel D, Schmid MT, et al. AP2 gamma regulates basal progenitor fate in a region-and layer-specific manner in the developing cortex. Nature Neuroscience 2009;12:1229-1237. Lehmann K, Schmidt KF, Lowel S. Vision and visual plasticity in ageing mice. Restor Neurol Neurosci 2012;30:161-178. Kang E, Durand S, LeBlanc JJ, et al. Visual acuity development and plasticity in the absence of sensory experience. J Neurosci 2013;33:17789-17796. Bonhoeffer T, Hubener M. Intrinsic optical imaging of functional map development in mammalian visual cortex. Cold Spring Harbor protocols 2016. Grinvald A, Lieke E, Frostig RD, et al. Functional architecture of cortex revealed by optical imaging of intrinsic signals. Nature 1986;324:361-364. Schuett S, Bonhoeffer T, Hubener M. Mapping retinotopic structure in mouse visual cortex with optical imaging. J Neurosci 2002;22:6549-6559. Kalatsky VA, Stryker MP. New paradigm for optical imaging: Temporally encoded maps of intrinsic signal. Neuron 2003;38:529-545. Teichert M, Liebmann L, Hubner CA, et al. Homeostatic plasticity and synaptic scaling in the adult mouse auditory cortex. Scientific Reports 2017;7:17423. Teichert M, Isstas M, Wenig S, et al. Cross-modal refinement of visual performance after brief somatosensory deprivation in adult mice. Eur J Neurosci 2018;47:184-191. Teichert M, Bolz J. Simultaneous intrinsic signal imaging of auditory and visual cortex reveals profound effects of acute hearing loss on visual processing. Neuroimage 2017;159:459-472. Cang J, Kalatsky VA, Lowel S, et al. Optical imaging of the intrinsic signal as a measure of cortical plasticity in the mouse. Visual Neurosci 2005;22:685-691. Heimel JA, Hartman RJ, Hermans JM, et al. Screening mouse vision with intrinsic signal optical imaging. Eur J Neurosci 2007;25:795-804. Heimel JA, Saiepour MH, Chakravarthy S, et al. Contrast gain control and cortical TrkB signaling shape visual acuity. Nature Neurosci 2010;13:642-648. Lehmann K, Lowel S. Age-dependent ocular dominance plasticity in adult mice. Plos One 2008;3:e3120. Kaneko M, Stryker MP. Sensory experience during locomotion promotes recovery of function in adult visual cortex. eLife 2014;3:e02798. He HY, Ray B, Dennis K, et al. Experience-dependent recovery of vision following chronic deprivation amblyopia. Nature Neuroscience 2007;10:1134-1136. Yeritsyan N, Lehmann K, Puk O, et al. Visual capabilities and cortical maps in BALB/c mice. Eur J Neurosci 2012;36:2801-2811. Teichert M, Bolz J. Data on the effect of conductive hearing loss on auditory and visual cortex activity revealed by intrinsic signal imaging. Data in Brief 2017;14:659-664. Cang J, Kaneko M, Yamada J, et al. Ephrin-As guide the formation of functional maps in the visual cortex. Neuron 2005;48:577-589. Naka KI, Rushton WA. S-potentials from colour units in the retina of fish [Cyprinidae]. J Physiol 1966;185:536-555. Albrecht DG, Hamilton DB. Striate cortex of monkey and cat: contrast response function. J Neurophysiol 1982;48:217-237. Prusky GT, Alam NM, Beekman S, et al. Rapid quantification of adult and developing mouse spatial vision using a virtual optomotor system. Invest Ophthalmol Vis Sci 2004;45:4611-4616. Wang Y, Wu W, Zhang X, et al. A mouse model of visual perceptual learning reveals alterations in neuronal coding and dendritic spine density in the visual cortex. Front Behav Neurosci 2016;10:42. Tang B, Kalatsky VA. Influence of body temperature on the evoked activity in mouse visual cortex. Brain Imaging Behav 2013;7:177-187. Prusky GT, Douglas RM. Characterization of mouse cortical spatial vision. Vision Research 2004;44:3411-3418. Beurdeley M, Spatazza J, Lee HC, et al. Otx2 binding to perineuronal nets persistently regulates plasticity in the mature visual cortex. J Neurosci 2012;32:9429-9437. Gianfranceschi L, Fiorentini A, Maffei L. Behavioural visual acuity of wild type and bcl2 transgenic mouse. Vision Research 1999;39:569-574. Sale A, Maya Vetencourt JF, Medini P, et al. Environmental enrichment in adulthood promotes amblyopia recovery through a reduction of intracortical inhibition. Nature Neuroscience 2007;10:679-681. Niell CM, Stryker MP. Modulation of visual responses by behavioral state in mouse visual cortex. Neuron 2010;65:472-479. Zhang S, Xu M, Kamigaki T, et al. Selective attention. Long-range and local circuits for top-down modulation of visual cortex processing. Science 2014;345:660-665. Poort J, Khan AG, Pachitariu M, et al. Learning enhances sensory and multiple non-sensory representations in primary visual cortex. Neuron 2015;86:1478-1490. Yan Y, Rasch MJ, Chen M, et al. Perceptual training continuously refines neuronal population codes in primary visual cortex. Nature Neurosci 2014;17:1380-1387. Iurilli G, Ghezzi D, Olcese U, et al. Sound-driven synaptic inhibition in primary visual cortex. Neuron 2012;73:814-828.